Our local farmers market stays open all year, but only now have the growers occupied their open-air stalls. There is still wind and cold weather, so about the only things available are greens and a few root vegetables. One exception to that is the beautiful trumpet mushrooms available from the “mushroom man”. If you are like me, you wind up buying way more from the vendors than you can possibly use. I try to plan daily menus in my mind as I walk down the aisles. Invariably, my eyes and appetite fail me so that when the end of the week and a new farmers market arrives, there are things still in the vegetable crisper. The trumpet mushrooms fell into that category this week, so when I looked in the pantry and saw a container of Arborio rice, I immediately thought of risotto. I also wanted to try a new brand of boxed fish stock as well as Better Than Bouillon fish stock base suggested by my friend, Jim Hastings. It seemed like a perfect excuse for shrimp risotto. On top of all that, the stove top smoker was still sitting on the kitchen counter after my effort at smoked new potatoes, so the stars just seemed to come together for smoked shrimp with mushroom risotto. Prepare stove top smoker by heaping special wood chips in the middle of the smoking pan. Cover the tray with aluminum foil to make cleanup easier and insert, along with rack in the smoker. Skewer 6 shrimp. Sprinkle with Old Bay seasoning, salt, and pepper. Place on the smoker rack, and close the top, leaving an opening of about 3 inches. Place the smoker over two burners of the kitchen range, both set to medium flame. When smoke begins to come out of the lid opening, close tightly and smoke for 20 minutes. Remove the smoker from the stove, open the lid, and remove the shrimp.If they do not appear to be done, replace the smoker lid and place over the flame for another 5 minutes. In a medium sauce pan with lid, heat the oil over a medium-low flame. Add the shallots and sweat, covered, for about 5 minutes. Add the rice, and raise the flame to medium, stirring constantly until the rice becomes opaque but does not brown. In the meantime, bring the fish stock to the simmer over another flame. Add one ladleful of stock to the shallot-rice mixture and raise the heat to bring to the boil. Stir frequently (constantly) until the liquid has almost completely evaporated. Then add another ladleful of the stock and again stir until nearly evaporated. Repeat the process until the fish stock is used up or the rice is creamy and tender, about 30 – 40 minutes . If you need more liquid to finish cooking the rice, use water. In the meantime, melt the butter in a small skillet over medium heat. Add the mushrooms and sauté for 5 minutes. Set aside. When you are ready to serve, stir the mushrooms into the risotto. Adjust the seasoning with salt and pepper. Top with the smoked shrimp and serve. There should be enough risotto for 2 to 4 persons, depending upon hunger. 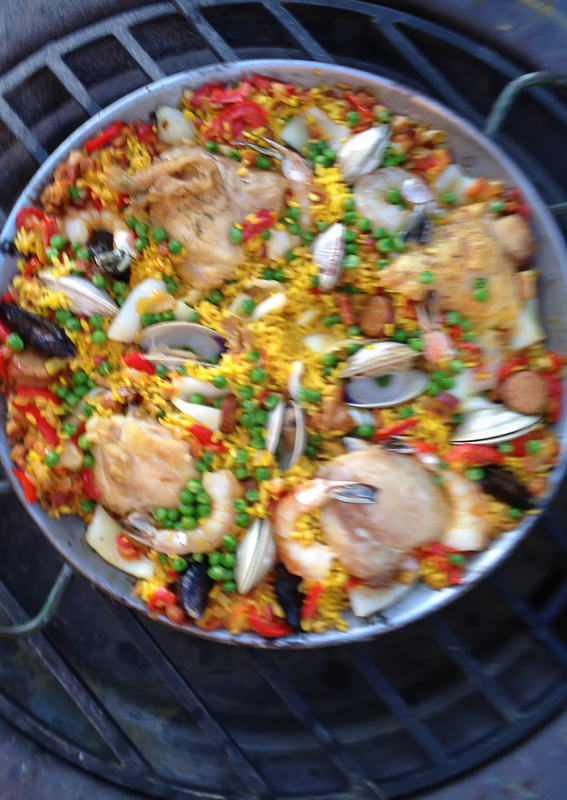 We still had a good time at our gathering, and cooking the paella over an open fire was the hit of the evening. We enjoyed some of the Cruz de Piedra, along with some vinho verde in deference to the Portuguese and a warm evening. Our friends brought a tasty green salad dressed with a simple vinaigrette along with a crusty batard of farm bread. Dessert was a classic flan except that it was flavored with chamomile and lime. I served it with the traditional caramel topping but along with cajeta made with fresh goat’s milk. As evening came, we just relaxed on the patio and watched the sun go down. 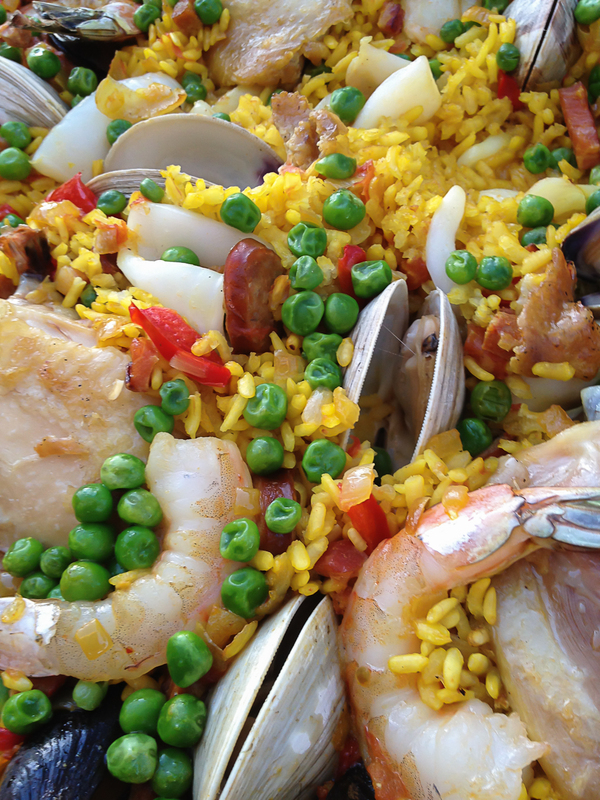 Paella is one of those things where you can just do whatever you please except for the required rice and saffron. The recipe that follows is the version I chose for the evening. On the stove, heat half of the olive oil over a medium high flame. When it is just shimmering, add the chicken thighs, skin-side down. Brown the chicken until the skin is crisp and brown, turning frequently so the chicken cooks through completely. Drain the chicken on paper towels and set aside. You may want to refrigerate if dinner is a long way away. Add the sliced chorizo to the hot oil and chicken fat. Turn frequently until lightly browned. Drain the cooked chorizo on paper towels and set aside. Add the pancetta and diced chorizo to the still hot pan. Stir frequently until the pancetta is just slightly browned but not crispy. Then add the onion, tomato, pepper, and garlic. Cook until the vegetables are well wilted, liquid has boiled off, and the mixture is a thick sauce. This is the sofrito. Transfer to a bowl and set aside. About an hour before you plan to start the paella, build a fire in the fire pit. Although a wood fire is traditional, charcoal briquettes are perfect. Back in the kitchen, pour out the oil and chicken fat from the pan. Add the remaining olive oil and heat until it shimmers. Then add the rice, stirring frequently until it is well coated. In the meantime, combine the fish and chicken stock in a large pot and bring to the boil. When the rice is evenly coated stir in the sofrito, salt, and saffron. Then pour in the boiling stock, and bring it back to the boil. It is now time to take the pan out to the fire pit. Be careful not to spill. When the pan is firmly set on the grate, make sure it is bubbling gently. From now on, don’t stir. Now it is time to add the other ingredients. First arrange the chicken thighs around the outside of the pan. Then put in the sliced chorizo. After a few minutes, place the clams, hinge side down, deep into the rice. Next add the mussels, and then the shrimp. Sprinkle the peas over the top. Then check to see how everything is going. Add more water if needed. Stir only if the bottom seems to be burning. Cooking should take around 20-30 minutes, depending upon the heat of your fire. Just 3 or 4 minutes before you think things are done, bury the pieces of squid in the rice. They will get tough if you cook them too long. In a small sauce pan, combine the sugar and water. Bring to a boil over medium heat. Do not stir but continue to boil until the mixture is a light amber color. Working quickly, pour some of the caramelized sugar into each of the ramekins, turning them so the caramel coats the bottoms and sides. Set aside. In a heavy-bottomed saucepan, heat the cream to a simmer along with the added tea bags and lime rinds. Heat for about 10 minutes. Then stir in the sugar, and remove from the heat. Let steep off the heat for another 10 minutes. Then strain into a bowl. In the meantime, combine the eggs and egg yolks in another bowl, using a whisk. Make sure that they are very well mixed. Whipping constantly, Pour a small stream of the heated cream into the egg mixture/ Not too much so that the eggs don’t scramble. Add a little more of the heated cream to temper the eggs, and then pour that mixture into the cream, whipping to combine completely. Pour the egg and cream mixture into the prepared ramekins. Arrange the ramekins in an oven-proof pan which will hold them comfortably. Pour the boiling water into the pan ust to the level of the tops of the flans, being careful not to get water in the ramekins. Transfer to the middle of the preheated oven and bake for 30 minutes. Remove the pan from the oven. The centers of the custards will still be soft. Place the pan on a cooling rack and allow the flans to cool completely in the water bath. They will finish their cooking as they cool. Cover the cooled ramekins with plastic wrap and chill in the refrigerator for at least an hour and even over night. To serve, run a thin spatula around the edge of each flan. Invert over the serving plate. The flan should slide out easily. If it does not, twist gently and it should come free.